I left the house at 10am anticipating traffic with people going to BBQ's and family events, yet there was no one on the road and we made it down there at 10:25am. To make it from my house to the stadium in 25 minutes would tell anyone that lives in this area that there was literally no one out. 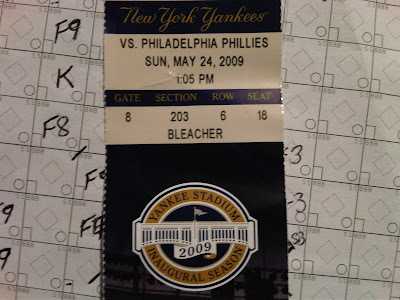 So my friend that I took to the game had never been to Yankee Stadium, old or new. I told her I feel sorry for her, and I really do. But if you think about it, if you had never been to the old one you probably have no judgement of the new one with no comparison. I brought my scoresheets today with every intention of keeping score. 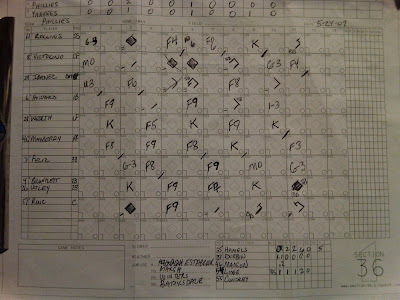 I had one of Ron's scoresheets from Section 36, and one left from last season that I never used. I will say that the unused one from last year has made it to several games with nothing ever written on it. I wrote Yankees and Phillies on them Friday, then put them away. Two less words I had to write today. A little before game time we noticed a guy a few rows behind us with a stuffed rabbit puppet. I wish I were joking, but I have the photo to prove it. I also have a video on my phone of this dancing rabbit, which I later overheard him saying the rabbit's name was Jackie Rabbitson. 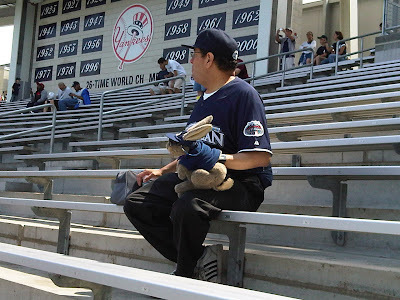 I asked someone that sits in the bleachers on a regular basis if they had seen this character before, and I was told that he sat out there years ago but stopped because he used to get made fun of. I wonder why. He followed that up with good thing Ray isn't here, otherwise we would really have roast rabbit. I laughed for 2 reasons and went back to my seat. Jackie Rabbitson danced to every song, and clapped most of the game. The rabbit was another reminder of why I stopped going to weekend games years ago. Not the same as the regular crowd on the weekends, and on the weekends you also get clowns telling you that you are in their seat. I had one of those today and almost snapped a bimbo like a twig. Yes, 'roid rage. The game was a great pitching duel with Sabathia and Hamels, though Sabathia gave up 3 runs he kept us in the game by not letting things get out of hand. I wish for the sake of my fantasy team that if the Yankees were not going to win in 11 innings that they could have just lost in 9 so Cole could get the win. We had a chance to win the game in the 9th but Teixeira grounded into a 6-4-3 double play moving Jeter to third, and bringing up A-Rod with 2 outs. They walked A-Rod to pitch to Ramiro Pena, and who wouldn't? He flies out, rally killed. I am praying Nady comes back soon so we can send Matsui back to his country- I am not kidding, he is on my last nerve. So 11 innings, and 2 sunburned arms later my scoresheets are complete. I figured I would have mailed it in by the 3rd, but I made it through the whole game with only 2 mystery outs. One of which was the second batter of the game so I didn't think finishing the game was possible. Anyone who has sat in the bleachers knows that if you want to actually pay attention to the game at all times, you really shouldn't be sitting there. Weekends it's easier to keep score since there are less people to distract you. They aren't pretty, but they are pretty much complete. I didn't finish all the pitching lines, and no I have no intention of filling it in. Took the same amount of time to drive home as it did to get there, which was another blessing after the Yankees teased me with the possibility of an extra innings win. The Yankees played extremely well on this homestand and showed heart and fight which was nice to see. 9 wins in a row is a good sign for the team, and if they can do that throughout the season we should be able to make the playoffs. Since the gym is closed tomorrow I was thinking about handwashing my car, but after sitting outside and cooking for 11 innings (and batting practice) I think I am going to stay in the igloo (house) and chill tomorrow. I'm going to watch the Twins/Brewers now and put some more aloe on my arms. Sooz is still pretty sick and not feeling well at all so any medicine (Jeter cards) anyone wants to send her may help her get better faster. There is no such thing as an ugly scoresheet. I probably should have included that every time I keep score, the Yankees lose. That's why I stopped long ago. I figured I was just being silly and took a crack at it again today. Kim and I having been mulling over a trip up to the new Stadium. We're just shooting around ideas but Kim really wants to see NYC for real. Not just a trip from Newark to Yankee Stadium. As for Hitters/Pitchers, I put the opponent's pitchers on the same sheet side as the hitters (i.e. Phils batters, NYY pitchers) so you don't have to flip the book over. 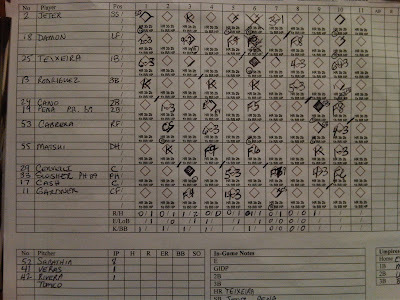 You are traditional in keeping the whole team together on one half of the scoring sheet (phils batters, phils pitchers). When I'm at Fenway, there are usually at least a couple people in the area keeping score, so mystery out are easier to fill in. I like the idea of putting the opposing pitchers on the hitters side. I scored a no-hitter once, and it's annoying that the sheet with the pitching line is the opposite side from the batters without the hits. It's not as nice to look at. That's a really good idea about the opposing pitchers. I never tried that. I think I just want to make double sided sheets from now on this way I just have to flip it, and save paper. And Section 36... I didn't even think about not putting your arch enemy on your score sheet, it was just on top and the Phillies come up first. Funny thing is, I actually was debating which team I wanted on which sheet after I wrote the line-ups but I figured it really made no difference. I should have known. I keep score by putting the pitcher with the opposing batters. It's easier to get their line score together that way. Someone in the bleachers showed me that. You definitely need to doubleside the sheets. Way easier to flip it over than having two sheets to deal with. I went to Staples and had them print up 25 or 30 double sided sheets, and spiral bound them with a cardboard cover (to write on) so it's nice and easy. But, I'm sad like that. In fact, to fill in the blank first page, I drew up a "how to score" page to put in. Yup. pathetic. But, only cost me like $7. Im dying to go out there for A game. Ill buy the tickets, but you and Sooz have to hang out with me. Ill bring A box of wax & we have to bust it during the game.